Michigan ultrasounds have many uses in medicine, from therapeutic applications to used in many different medical procedures. It is quick and easy to prepare for an ultrasound in Michigan. Soft-tissue injuries or minor sports injuries can be treated with Michigan ultrasounds. The effects of therapeutic ultrasounds can be tissue healing by stimulating the production of more collagen, increasing vibration causing heat, or by increasing blood flow which helps in the sub-acute phase of tissue injury. This is typically used during rehabilitation and pain management treatment. Early stage pregnancy ultrasounds can be used to determine due dates or reveal the presence of multiple babies. Ultrasounds could also be used to detect certain problems such as ectopic pregnancies, birth defects, placental complications, or breech positions. 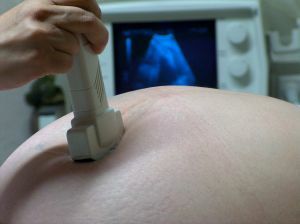 Later term ultrasounds can be used to learn the gender of the baby or how large the baby is. Doctors use Michigan ultrasound imaging during procedures when they have to test a very precise area of the body. The ultrasound allows them to pinpoint the exact problem area, allowing for accurate treatment. A wide range of conditions can be detected through ultrasounds that affect the organs or soft tissues of the body. Contact Millennium Medical Group Westland to set up your ultrasound appointment today!